The Little Whisk & Co: Caramel Popcorn and Chocolate Chip Cookie. Caramel Popcorn and Chocolate Chip Cookie. 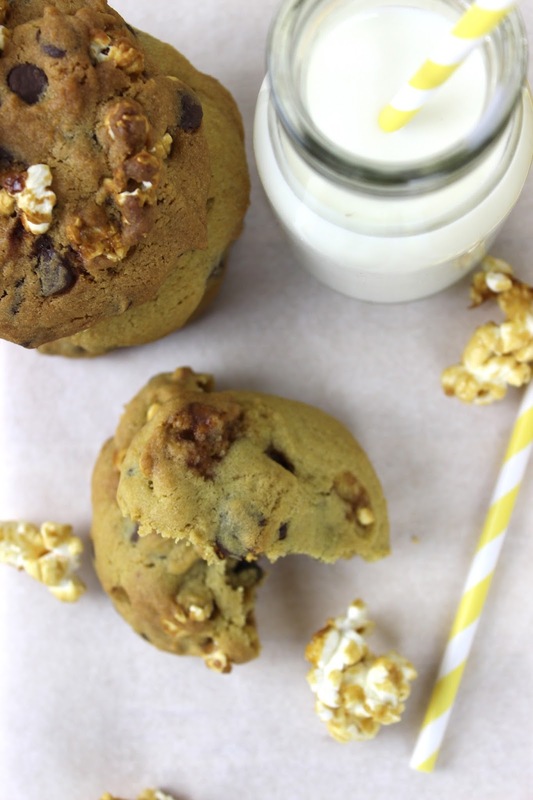 Today I am going to share with you a delicious caramel popcorn and chocolate chip cookie. Who knew you could put popcorn in a cookie? The cookie crumbles in you mouth and remains soft for quite a while, as we all love a warm gooey cookie rather than one that goes hard and crispy within minutes after been taken out of the oven. Trust me, it has taken many recipes to find the one cookie recipe that is perfect - soft, crumbly, delicious, bursting with flavour, adaptable, easy, and well to be honest I still don't believe I have found the right one just yet. The crunch of the popcorn, sweet caramel and oozing melted chocolate delights your stomach and satisfies that sweet craving. It is perfect to eat slightly warmed, so blitz it in the microwave for about 10-20 seconds so that the chocolate begins to melt. Also a glass of cold milk is refreshing on the palette. I am very precise when it comes to the size os my cookies. I have recently found that the average sized cookie weights 60g, so feel free to make them small for tiny bites or large for a gigantic cookie. Caramel Popcorn and Chocolate Chip Cookie Recipe. 1. Preheat the oven to 150-degrees and line a baking tray with parchment paper. 2. Place the popcorn in a large bowl once popcorn as per the instructions on the popcorn pouch or bag. 3. In a medium saucepan over medium low heat, melt the butter and sugar together. Once it is almost melt increase the heat to medium and bring the mixture to a boil, stirring continuously. Cook for 3-4 minutes, whilst stirring. 4. Remove from the heat and mix in the vanilla, salt and baking soda. Stir until smooth. Poor the caramel over the popcorn quickly making sure to evenly cover the corn. 5. Spread the caramel corn popcorn onto the prepared baking tray and bake for 20-25 minutes. Make sure to stir every 5-8 minutes. 1. Preheat the oven to 180-degrees and line another baking tray with parchment paper. 2. In a bowl of a stand mixer or ordinary bowl, beat the butter and sugars together until pale and creamy. 3. Add the egg, followed by the vanilla, mixing after each addition. 4. In a bowl, combine the flour and baking soda. Add slowly to the mixture and mix until combined and now add the chocolate chips and caramel popcorn, gently mixing. 5. Drop your desired sized cookies onto baking trays making sure to leave room between each and bake for 10-12 minutes or until golden. Mine were around 60g in size. 6. Allow them to cook on a wire rack for 5-10 minutes. However feel free to warm through in the microwave for 20 seconds to slightly melt the chocolate and caramel. Raspberry & Cream Pastel Layered Cake.